1. A trespasser who intrudes on the privacy or property of another person without permission: Lydia, the hostess of the birthday party, had an interloper, or uninvited guest, thrown out of her house. 2. 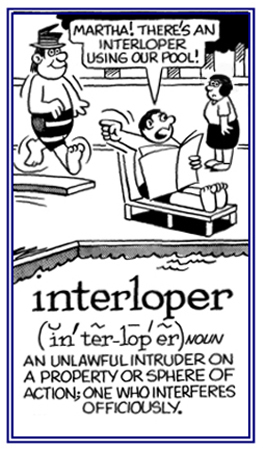 Etymology: from Latin inter-, "between" + Middle Dutch loopen "to run"; so, "someone who runs between or intrudes". © ALL rights are reserved. 1. A period of time between events or activities: Hayden resumed his acting career after a short interlude. 2. An interval in the performance of a play; the pause between the acts, or the means (dramatic or musical) employed to fill this pause: During the first interlude at the theater production, Terry started to talk with his friends. The brief interlude during the long play featured comical characters juggling balls. 3. 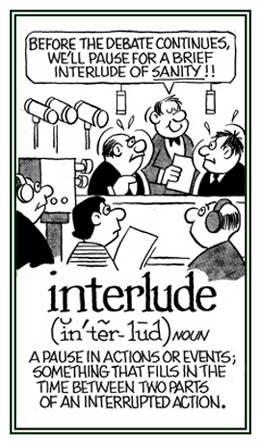 Etymology: from Middle Latin interludium, "an interlude"; from Latin inter-, "between" + ludus, "a play". Originally, farcical episodes introduced between acts of mystery plays. © ALL rights are reserved. Pertaining to the period between the old and new moon during which the moon is not visible from the Earth. The period of time between the old and the new moon. Between the malleoli (plural of malleolus, a rounded process, such as the protuberance on either side of the ankle joint). 1. Acting or of the nature of action between two persons, parties, etc. ; serving as a means of interaction; mediatory. 2. Situated or occurring between two things (in space, time, degree, or character); intermediate. 3. One who acts between others; an intermediate agent; a go-between middleman, mediator. 1. Coming or occurring between two things, places, etc. ; holding the middle place or degree between two extremes; interposed, intervening. 2. In spatial position, situated in the middle place, or between two things or places. 3. Occurring or coming between two points of time or events. Intermediate technology: (1) a technology that is intermediate between other technologies or represents a transitional stage between them; (2) technology devised for the developing world which is simpler, cheaper, and more environmentally friendly than that of the developed world, and so it is better suited to local resources and knowledge; but which is more efficient or productive than traditional local crafts; the development or advocacy of such technology. Showing page 9 out of 18 pages of 260 main-word entries or main-word-entry groups.